Made in Japan from quality ceramic, this Japanese Saki Set resembles the hues of a deep blue ocean. Enjoy your favorite sake, hot or cold, with this beautiful sake set by the sea. With a unique long jug, this Japanese saki set has twine around the neck of the sake jug to assist when pouring. The narrow spout of the jug will also help pour out a smooth flow of sake as well. 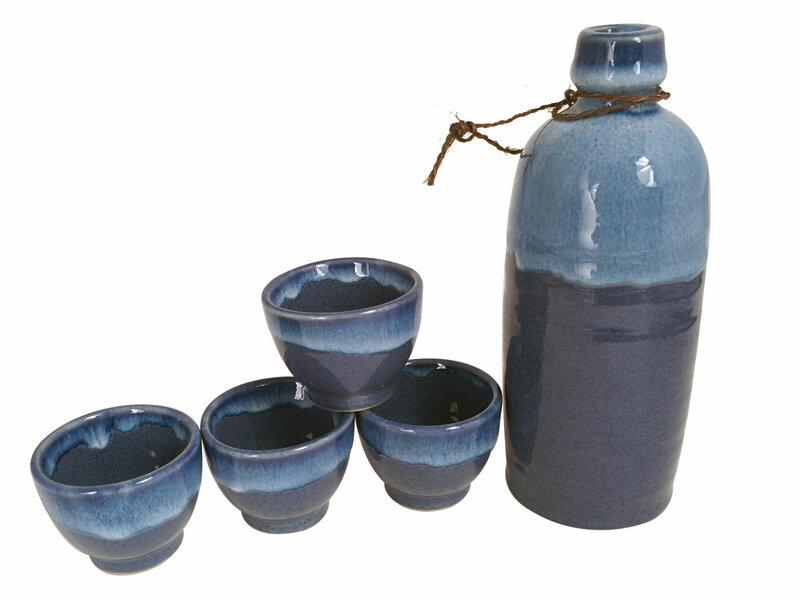 With speckled hues of a pale light blue and a deep dark blue, the sake jug and cups resemble colors of a blue ocean deep within a cave. The small sake cups continue with this same design on the inside and outside of the cup as well and are small enough to take small sips or take down one whole gulp. Packed in a paper gift box, this Japanese saki set is perfect to give as a gift as it can easily be gift-wrapped. To enjoy warm sake, simply place the sake jug in a warm bath in a pot for a few minutes.